Terrier freshman Clayton Keller, Patrick Harper and Jake Oettinger have been named to Hockey East’s Pro Ambitions All-Rookie Team. 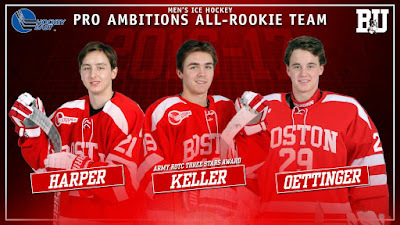 Keller, the conference’s leading freshman goal- and point-scorer with a 12-15-27 scoring line (within conference play) was a unanimous selection. He also tied with Notre Dame’s Anders Bjork and UNH’s Tyler Kelleher for the top spot for the Army ROTC Three Stars Award. Oettinger was runner-up for the Goaltending Champion Award. Sophomore defenseman Charlie McAvoy was runner-up for the Best Defensive Defenseman Award. ►Hockey East announced today that ESPN3 will air Friday's conference tournament semifinals and Saturday's championship game outside of New England. ► HockeyEastOnline Seminfinalist Coaches Conference Call. Head Coach David Quinn comments began at 23:00. 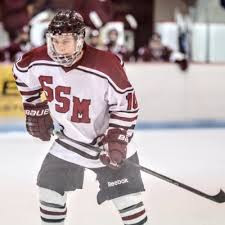 USA Hockey announced invitees to the 2017 NTDP Evaluation Camp and the list of 46 players includes six skaters committed to BU: forwards Robert Mastrosimone (photo, Shattuck St. Mary’s 16U) and Trevor Zegras (Avon Old Farms); as well as defensemen Braden Doyle (Lawrence Academy), Case McCarthy (Jr. Sabres 16U), Alex Vlasic (Chicago Mission 16U) and Cade Webber (Rivers School). Of the 16 defensemen invited, a combined nine have verballed to BU, BC and Harvard. The 6-3, 182 lb native of Greely, ON posted 4 goals and 13 points in 41 games this season. An all-around defenseman who has the size and strength to play a defensive game while also having the vision and smarts to contribute offensively. Is an elite puck-mover with the ability to carry the puck or make a good first pass. Jack Eichel’s 20th goal gave Buffalo an early lead but the Sabres dropped a 4-1 decision to San Jose. With 48 points in 49 games, Eichel has the NHL’s ninth best points-per-game stat. Nice article. What about ezTalks for your free video conferencing? Screen Sharing,Annotation,WhiteBoard, IM for Group/Private Chat,Recording, Playback and more.